Koh Chang is a stunningly beautiful collection of islands that offers an interesting potpourri of experiences that will make you fall in love with Thailand, again. I took a flight from Bangkok to Trat on Bangkok Airways, and in an hour I landed at the picture perfect airport of Trat that seems like a resort, complete with landscaped lawns, elephants carved in grass and a façade that looks straight out of a fairytale. Even the luggage is actually placed in a specific location – there is no belt! Driving through the countryside post a quick lunch I was soaking in the shades of the green landscape and blue skies and was soon at the ferry station to Koh Chang. 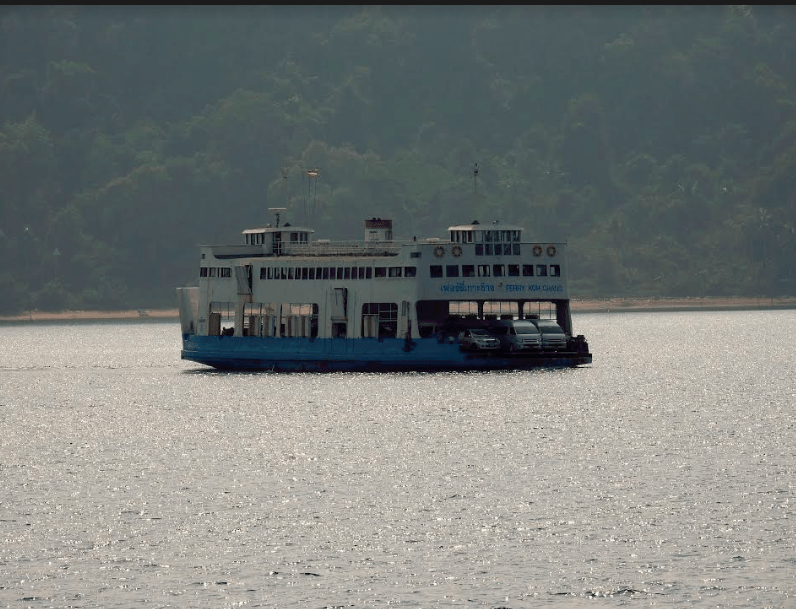 Being an island, the only way to reach Koh Chang was through the ferry and this one was large, all the vehicles actually drive through the lower level of the ferry and an upper level is where you can catch enticing views of the blue lagoon. 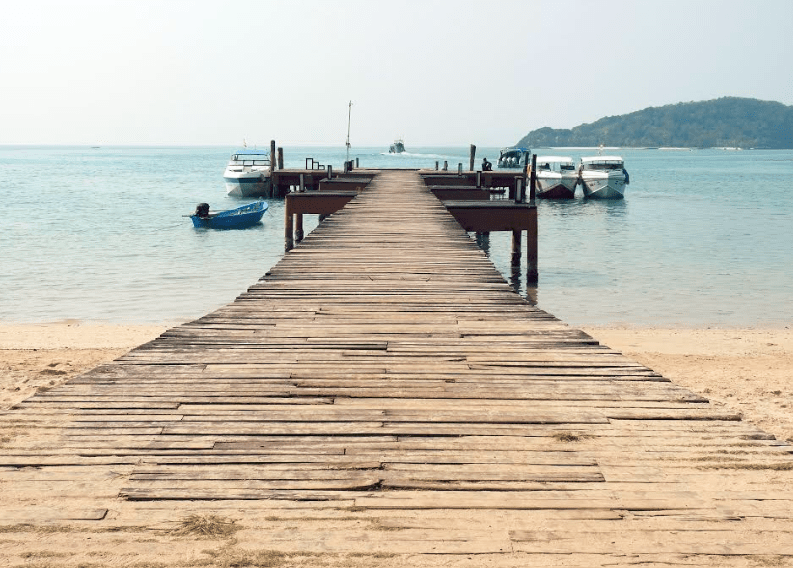 When you are in an island the best thing to do is explore the vicinity and Koh Chang is one of the best islands of Eastern Thailand with some of the most picture perfect beaches. And since there are many satellite islands all around, the best way is to hop on to a speed boat and make pit stops to experience them. My first stop was ae the stunning and serene Koh Rang Island that has a setting straight out of a postcard with swaying palms, mountains and a clear blue sea. In fact at Koh Rang the water at the shore is quite shallow and even if you do not know how to swim, the waters are calm and you can take a dip in them. There are swings hanging from trees on the shore so you can even sit on them and soak in the sights and sounds of the island. Koh Mak and Koh Wai are other nearby islands that you can visit here. 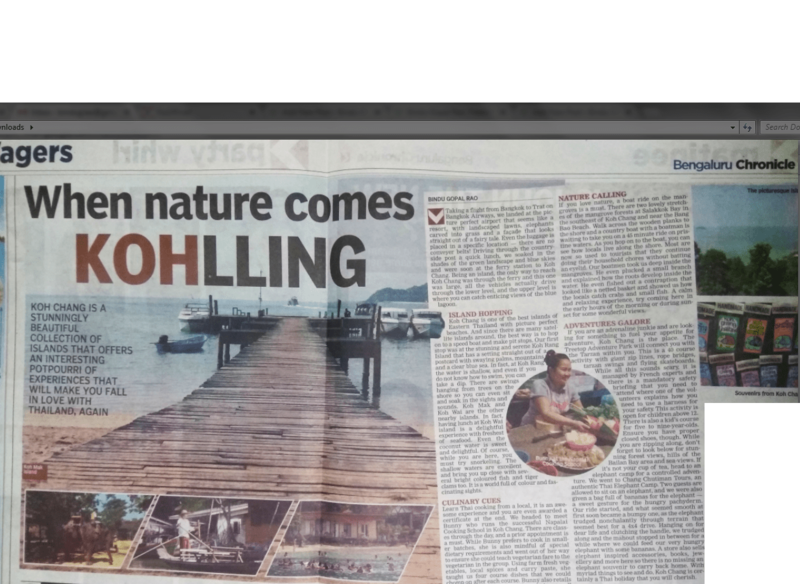 In fact having lunch at Koh Wai island is a delightful experience as there is fresh sea food served. Even the coconut water here is sweet and delightful. Of course while you are here you must try the sea activities especially snorkeling. The shallow waters here are excellent snorkeling sights that will bring you up close with several bright coloured fish and tiger clamps too. It is a world full of colour and fascinating sights so simply follow the instructions and you could be taking away your best memories from your trip to Thailand. 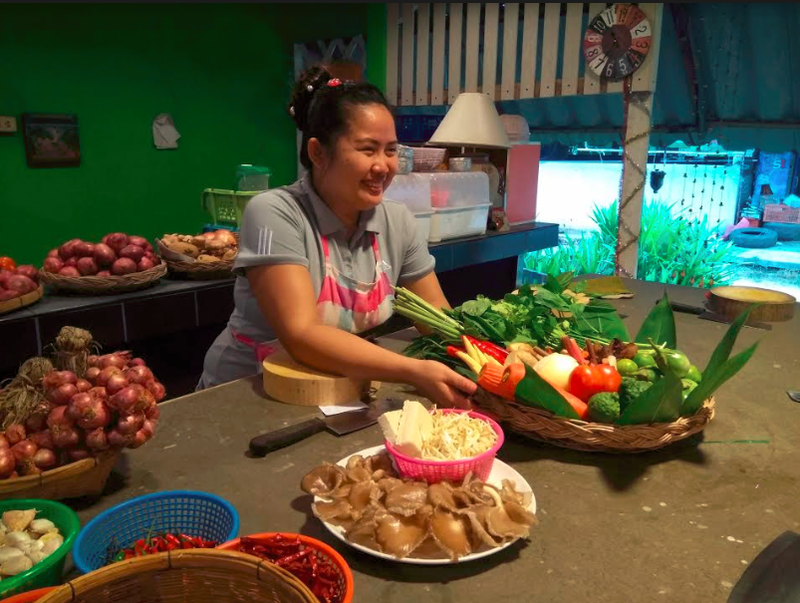 How does it feel to learn Thai cooking from a local? Well it is awesome and also a great experience when you are awarded a certificate at the end of it. So I headed to meet Bunny who runs the successful Napalai cooking School in Koh Chang. There are classes at different points of the day and a prior appointment is a must. While Bunny prefers to cook in smaller batches, she is also mindful of special dietary requirements and went out of her way to ensure she could teach me a completely vegetarian meal. Using farm fresh vegetables and local spices and curry pastes she taught us a four course meal that we could eat after each course. Keeping the session interactive and engaging, the two plus hours simply flew by. Bunny also retails all the products she uses including the special rice here so make sure that you pick up what you need. Even her magnets and key chains are all hand-made and support local artisans. She is one person who certainly has her heart in the right place and her cooking reflects exactly that sentiment. If you love nature, a boat ride on the mangroves is a must. There are two lovely stretches of the mangrove forests at Salakkok bay in the southeast of Koh Chang and near the Bang Bao Beach. Walk across the wooden planks to the shore and a country boat with a boatman is waiting to take you on a 45 minute ride on the pristine waters here. As you hop on to the boat you can see how the locals live in the surrounding area as their homes are along the shore. Most of them are now so used to tourists that they continue doing their household chores without batting an eyelid. Our boatmen took us deep inside and the mangroves are a delight especially from close quarters. He even plucked a small branch and explained how the roots develop inside the water. In the middle of the ride he even fished out a contraption that looked like a netted basket and showed us how the locals catch crabs and small fish for their food. This is certainly a calm and relaxing experience when you are here. Try to come here in the early hours of the morning or during sunset for some wonderful views. If you are an adrenalin junkie and are looking for something to fuel your appetite for adventure, Koh Chang is the place to head to. The Treetop Adventure Park will connect you with the Tarzan within you. 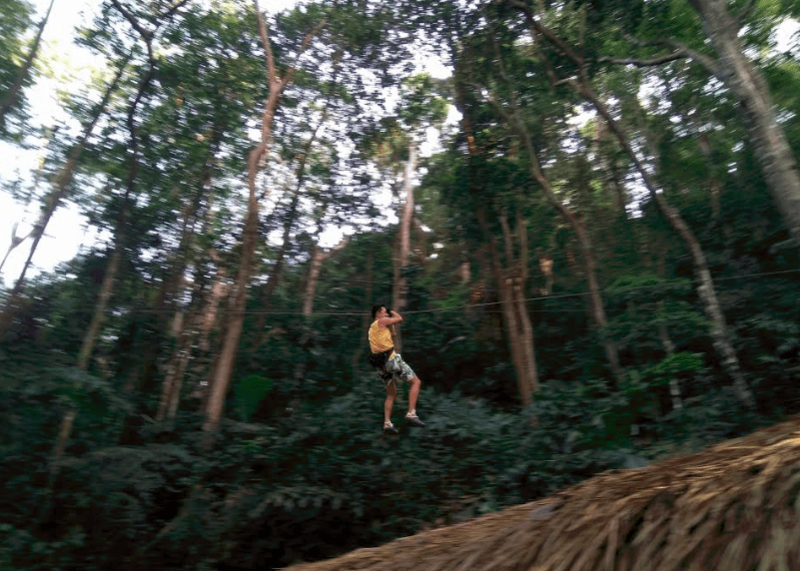 This is a 40 course activity with giant zip lines, rope bridges, tarzan swings, flying skateboards. While all this sounds scary, it is managed by French experts and there is a mandatory safety briefing that you need to attend where one of the volunteers explains how you need to use a harness at all times for your safety. This activity is open for children above 12 and the minimum height they must have is 1.40m. There is also a kid’s course for 5-9 year olds. Just ensure you have proper closed footwear and do not wear ones that will fall off like flip-flops. The course is divided into two sections – an easy blue course and a more challenging red course. And while you are zipping along don’t forget to look below for some stunning forest views, hills of the Bailan Bay area and sea-views from the top. You can even take a break in between and tuck into some delectable cut fresh fruits here. And if that is not your cup of tea, head to an elephant camp for a controlled adventure. I went to Chang Chutiman Tours, an authentic Thai Elephant Camp for an elephant ride through dense nature. 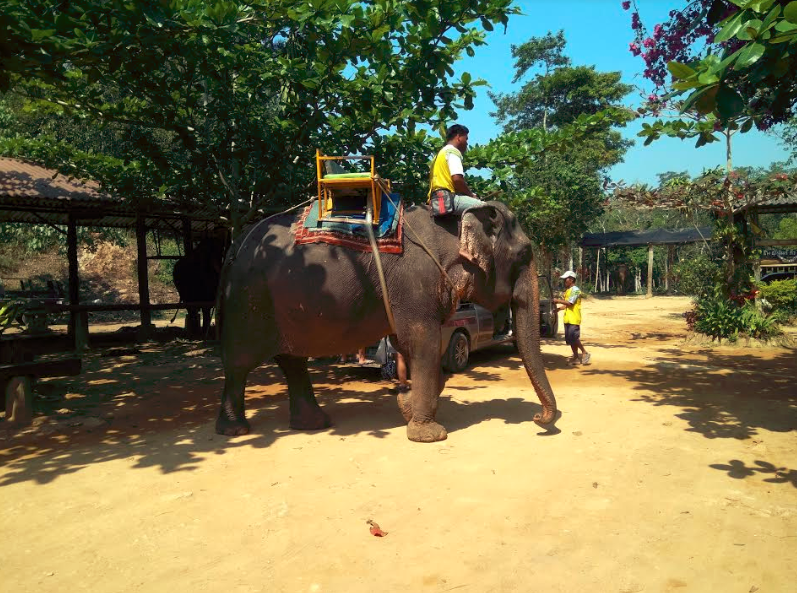 Two guests are allowed to sit on one elephant and you need to climb onto the back on the elephant by accessing an elevated area which is the start point. We are also given a bag full of bananas for the elephant on the way which I though was a sweet gesture. After this our ride started and what seemed smooth at first soon became full of action as the elephant walked nonchalantly through terrain that seemed a best fit for a 4×4 drive. Hanging on for dear life and clutching to the handle, we trudged along and the mahout stopped in between for a while where we could feed our very hungry elephant with some bananas. The bumpy ride is good way to see the vegetation of the island too. A store also sells elephant inspired accessories, books, jewellery and more here so there is no missing an elephant souvenir to carry back home. With myriad things to see and do Koh Chang is certainly a Thai holiday that you will cherish.